Affinity purified against GST-PFK2 (1 – 30) and then depleted against GST. More than one band shows up on the Western blot but a high intensity band of the predicted endogenous size is detected in lysates of HEK 293 cells. Data not shown. 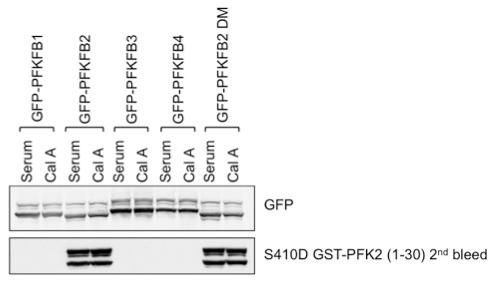 Specificity of S410D is shown below where GFP-tagged PFKFB1, 2, 3 and 4 was expressed in HEK 293 cells and 30 μg of the lysate was used in immunoblot.